Don't go paving too many roads or you'll find your islanders discovering the convenience of door to door over station to station. I do have my eye on some other road vehicles, but given my luck with bidding they probably won't materialise. Anyway, the local roads are too narrow for large HGVs - a couple of 1 or 3 ton lorries or light vans shouldn't threaten the railways just yet. Remembering a trip I took to Jersey in the 1970s, most of their commercial transport then dated from the 1950s so applying that to Isla Blanca suggests that much of the road traffic might date back to the 1930s. I'm also just old enough to have a hazy memory of Post Office vans with the same outline as my recently purchased Sainsbury's van, still in use c. 1950 - they must have been 15 -20 years old then, with WW2 having delayed their replacement with something more modern. A planned programme of railway wagon building is going to give the island's railways a better chance of seeing off competition for a few more years, when some new tourist income will enable better roads to be built. ... so applying that to Isla Blanca suggests that much of the road traffic might date back to the 1930s. In a warm climate there's no salting the roads in winter, so road vehicles last longer before crumbling into a heap of rust. There's a Model T Ford pick-up still earning its keep doing local deliveries in Cuarto de Pulgada. It's a Lledo van that met with a hacksaw. The new back and roof of the cab and bed of the load area are cardboard. That's interesting, Bob. 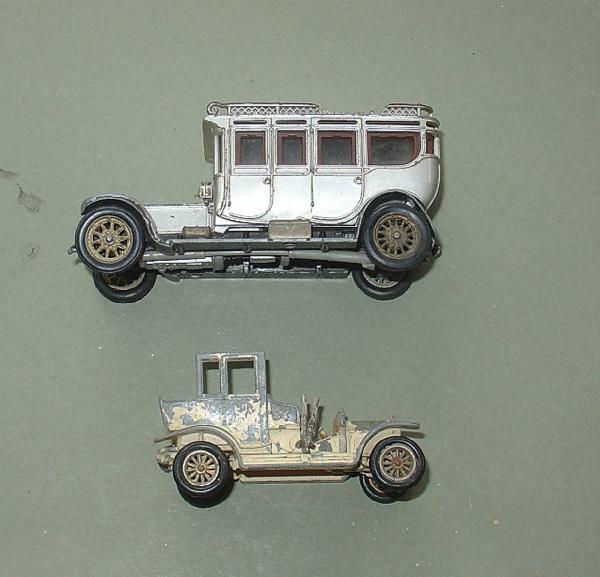 I'd not thought of up-scaling those Lledo vehicles, but the simple cab of the Model T does lend itself to such work, very easily I'd guess. Meanwhile, on the rails, there are some plans afoot. I'll give a Bachmann Trolley car a test next week-end and is all's well it could become the 3rd mechanism for the Este's passenger railcar; I love the growl and smooth control of the Piko motor, but it means having a very tall blunt-ended radiator, which I don't like. The Bachmann mechanism means a return to the original Gnomy bonnet, and also sets the wheels a little further inboard, making positioning on the Paseo turntable a lot easier. The Piko motor can then be transferred to the Norte's diesel to improve its performance. With less than complete success bidding on eBay I have the potential of three or perhaps four assorted light vans, of uncertain vintage, for use around the layout. Two are missing wheels, so I'll either have to cannibalise, look out for a battered bargain at a show or else work out how to cast some replica wheels. It's taken me almost two months to check if the wiring work done in January was OK. Luckily about 95% of it was, but there were a few circuits left accidentally open, a loose wire or two and a couple of other issues, all of which have been cleared up over the last two days. The panel switch for the spur off the turntable had to be sacrificed as I needed another wire running through the power looms between the Paseo control panel and the layout, and used the spur's connection as this track has been virtually unused in the years since the layout was first built. It then occurred to me that the spur could be fed off the turntable feed with a switch semi-concealed by the forge's coal pile. I need to touch in some ground damage, but the idea works fine. This may be the way forward, at least for smaller control panels, which may be planted in the scenery rather than on separate panels. I'll see how things look once the layout progresses further. If the turntable siding doesn't get used why not make a feature of it as disused siding? 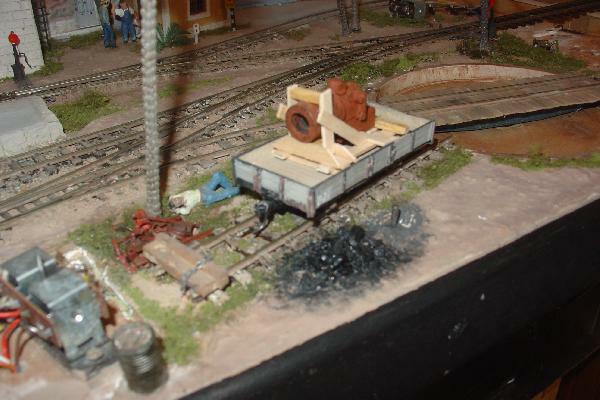 Rusty rails, weeds and litter, and a red flag stuck in the ballast to prevent access from the turntable. Fair point, Bob. The siding is a "just in case" provision, giving a potential hidey hole for an unexpected loco that cannot be sent down to the depot at San Juan as there are no spare paths in the traffic pattern. With the possibility of more railcars this could be useful. It had been intended to stable the Norte's diesel on excursion days, but the spur is a tiny bit too short. Now might be the time to extend it. It was a very simple addition, only taking ten minutes, and the baseboard was tipped up for maintenance anyway, so getting underneath was not a problem. A good day out at the Wealden show yesterday particularly as far as Isla Blanca purchases were concerned. I bought a couple of cheap(ish) diesels from a friend on the French Railway Soc. They are not really good enough for shunting, but should run OK for use as railcars once they've had a bit of tlc. 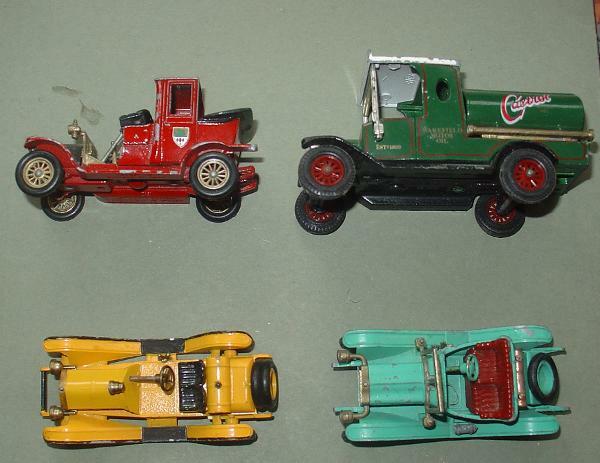 Today a package arrived with some fleabay purchases from last week - three Matchbox lorries. Two have a missing wheel and/or other cosmetic damage but all are repairable. There is another similar lot due in a few days with the capability of swapping wheels around - or so I thought. Now I think I see a cunning plan coming over the horizon. 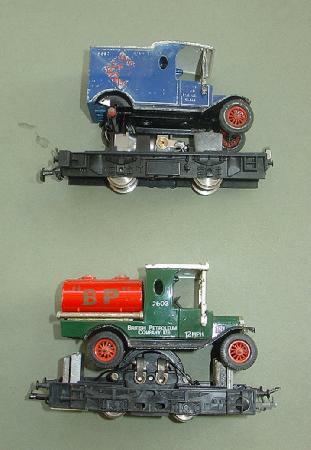 It looks like the van will fit over the Jouef chassis (which is rubber-band driven) while the BP tanker looks promising on the Lima chassis - though the Dremel will be out to open up the bottom of the body to fit the pancake motor inside. In both cases the original weights will need replacing with some sheet lead stuck inside the metal bodies, which should be at least as heavy as the original weights. I can remove the black lorry chassis easily enough so that the bodies will sit on a flat deck added to the motorised chassis. So, out of this we might have another runabout for track inspection or the movement of light stores, and a self-propelled weed-killing rail-motor - inspired by a similar conversion on one of the layouts at the show. This featured an old BEC tramcar chassis, but a generally similar conversion should be possible. In passing, I note that the BP tanker has left-hand drive, where the other Yesteryear models are right-hand drive. In this normal, does anyone know? I see that the serial number is not displayed under the tank lorry. 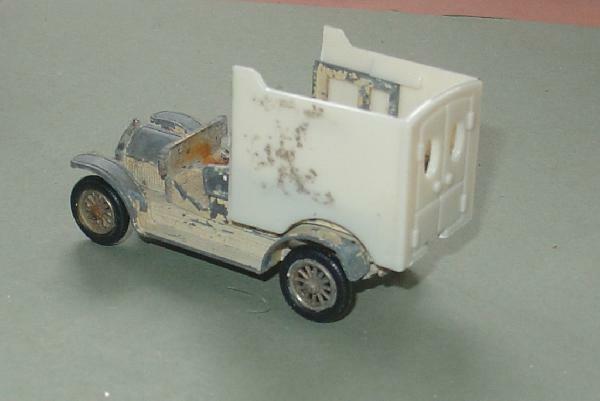 The third van in the package is a Talbot in need of a new rear door (easy in styrene). By chance, I happened to walk past a mushroom tray marked "Help Yourself- Free" at the show and saw the breakdown van, pictured above, which didn't stay there much longer. Also taken was a self-printed factory wall with a partially low relief finish. May be useful, after modification to suggest the Este workshops alongside the turntable at San Juan. Edit: Later: the blue van's body came off easily, just three rivets to drill out. It, too, will need a little internal floor cutting out, but it won't take much to fit it to the new motorised chassis. After a little oil the Lima chassis is running extremely freely. It moves slowly at about 10% power, while no more than 20% is a good line speed. The Jouef one is a lot steadier, but both run well with the weight of the die-cast bodies resting on top. Suddenly, that spur off the turntable at Puerto Paseo is starting to make sense. The wheels came off............the blue van's chassis quite easily, so the Talbot is no longer a three-wheeler! Postie came yesterday while I was out so I have to go down to the sorting office today to pick up what I think will be a second package of Yesteryear models in need of chopping, mending or re-painting. Will post pictures and thoughts on their futures when I've seen them. The first four are the best with an oil tank lorry, which might end up with a flat-bed body, and two early sports cars. Not quite sure what to do with the Landaulette - possibly a light van. Next is a bus (Rolls Royce, no less), which can be posed in the station yard ready to take train passengers out to the surrounding villages. It needs destination boards to hide the broken luggage rack. The last is the worst example, but might become a light van using the box-body from a plastic model T that was cannibalised a long time ago. The look to aim for with the Yesteryear conversion. 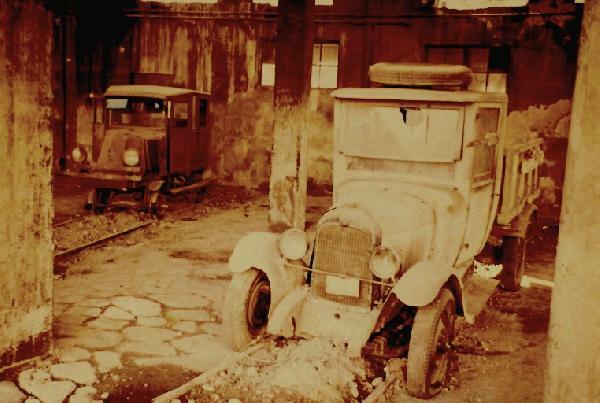 This is one of the Majorca Railways road delivery lorries photographed in the early 1970s in the derelict roundhouse at Palma. The little railcar in the background was used by the General Manager to commute from his home in Arta, at the far end of the line, to his office in Palma. It was built in the Soller Railways workshops and was a copy of their inspection car. Can the yesteryear model be converted into a pick-up, or flat bed, instead of a van? This would give an opportunity for some fine detailing to lift the old casting a bit? Yes, it probably could, Alastair, but the van body does fit it to a T.
My current thoughts are that the BP tanker will probably become a pick-up or flatbed, and the Castrol one will be the railway version as it lacks a steering wheel. 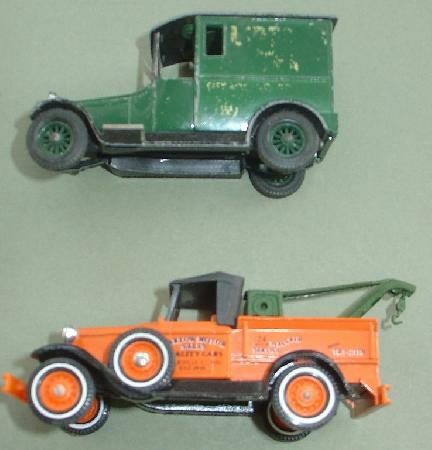 The landaulet might also become a flatbed truck, and the breakdown truck might lose its crane. Found this on a friend's blog. It's a must for fans of railways in tropical climates and ticks all the boxes: narrow gauge; bags of character; idiosyncratic operating methods; exotic setting; interesting rolling stock. Although it appears to be 600mm gauge, it's a world away from a Welsh slate railway. In fact it made me think of a certain trans-Andean line not unknown on this website, and may be not unlike the as yet un-modelled Tranvia de Trinidad from Isla Blanca.